The simplest of men's hats in Korea, the round woolen cap quan, worn every day in cold weather. 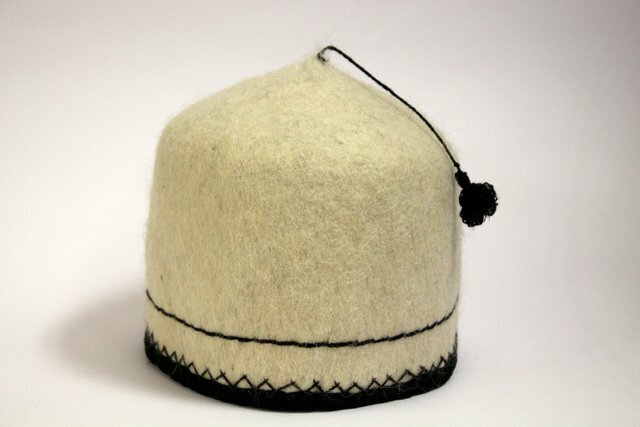 It is made of wool, and usually the only decorations it has are the black edge with geometric patterns and black stitching at the bottom of the crown. Often (as in this sample) the top is also decorated with a brush on a short cord. Traditionally, the quan is considered an everyday headdress of a poor man, in contrast to the more refined headgear worn by the aristocracy.